The taste of this milky, cinnamon flavoured custard tart is to me pure nostalgia! A true South African (and family) favourite, it seems that recipe variations for this delicacy are vast. While the old school flaky puff pastry case (often baked in enamelware) certainly makes for a glorious, traditional showstopper, this recipe is certainly a more simple, everyday affair. However, if you like, you can substitute the dough crust with puff pastry or shortcrust pastry instead. I favour the addition of vanilla for the custard while some traditionalists swear by naartjie peel or almond extract. You can even separate the eggs if you prefer a more souffle-like texture on the top (simply whisk the whites to stiff peaks then fold them into the custard before baking). Nevertheless, which ever version, still the ultimate South African taste-like-home comfort food. To make the dough for the crust, weigh the flour, sugar and salt in a large mixing bowl or food processor bowl fitted with a blade attachment. Add the cold butter and mix with your fingertips or pulse in the food processor until uniform and the mixture resembles fine breadcrumbs. Add the water and combine briefly to form a uniform dough. Form the dough into a disc, clingwrap and refrigerate for about 20min. Remove the rested dough from the fridge and gently roll it out onto a well floured work surface (to about 2mm thickness). Once the dough is rolled out large enough to line your baking dish/tin, leave it to rest on the work surface for approximately 5 minutes. Roll up the dough using a rolling pin and drape it over the tin. Gently line the tin with the dough taking care not to stretch it too much. Cut the edges by pressing with the rolling pin over the tart tin. Prick the base with a fork and refrigerate for approximately 10 minutes until the dough is firm. 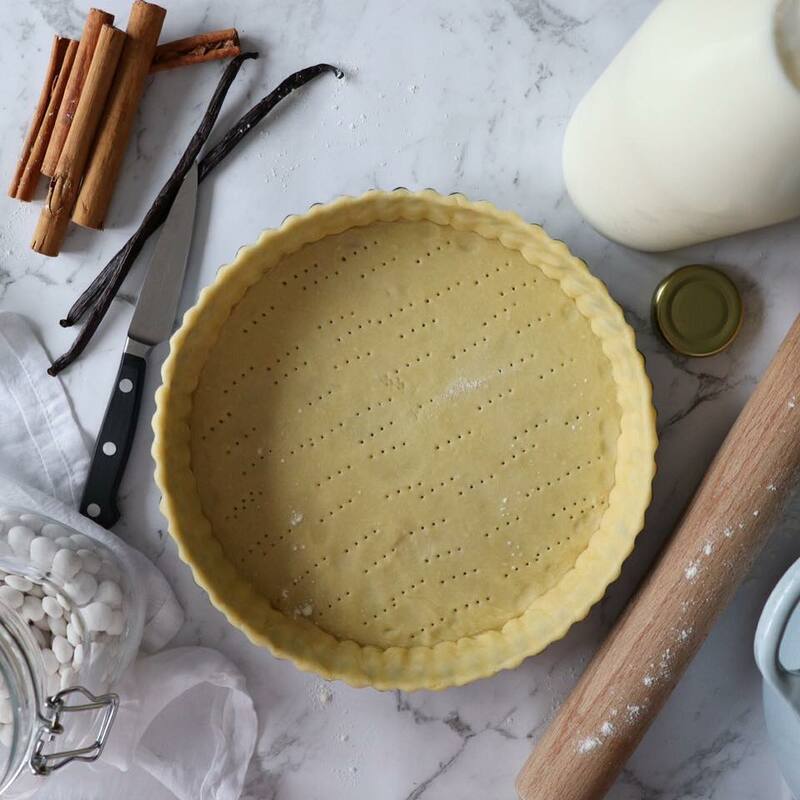 Traditionally speaking, most milk tart recipes do not call for blind baking of the dough/pastry before the filling is added. However, I prefer to blind bake my dough/pastry. If you're not blind baking the dough, keep it refrigerated until the custard is made and allow for 10 minutes additional baking time once the custard is poured into the dough/pastry case. To blind bake the dough/pastry, preheat the oven to 180°C (160°C fan). Remove the tin from the fridge and line with a crumpled sheet of baking paper (I wet mine to soften it, then dry it again with a kitchen towel to prevent it from sticking to the dough). Fill with baking beans or rice and bake until the edges are golden (approximately 15 - 20 minutes). Carefully remove the baking paper together with the baking beans/rice and return to the oven until the bottom is a light golden colour too. Prepare the custard by pouring the milk into a large saucepan. Add the butter, cinnamon stick (you can break it up a little if you want a more robust cinnamon flavour) and scraped out seeds and empty vanilla pod (alternatively, you can use 5ml vanilla bean paste instead). Place over a medium heat to infuse. Place the sugar and eggs in a large mixing bowl and whisk until pale. Add the flour, cornflour and salt and whisk well until smooth. Slowly add the warmed milk mixture to the sugar and egg mixture stirring continuously until the saucepan is empty. Place a large sieve over the emptied saucepan and pour the milky egg mixture back through the sieve to discard the vanilla pod and cinnamon stick. Stir the mixture continuously over a medium to high heat until the custard comes to a boil. Pour the cooked custard into the pasty case and return to the oven for 15 - 20 minutes. Once baked, remove from the oven and allow the tart to cool in the tin. However, this delicacy can be served either warm out of the oven or cold the next day (refrigerating until it is served). Before serving, sprinkle the top of the tart liberally with ground cinnamon or cinnamon sugar.